Twitter seems to be betting on the universal language of stickers to spur more engagement on the platform. In the next few weeks, Twitter will begin letting users add stickers to photos that can be resized, rotated and placed anywhere on photos posted in tweets. The feature will be available on iOS and Android apps and also on the platform's website. 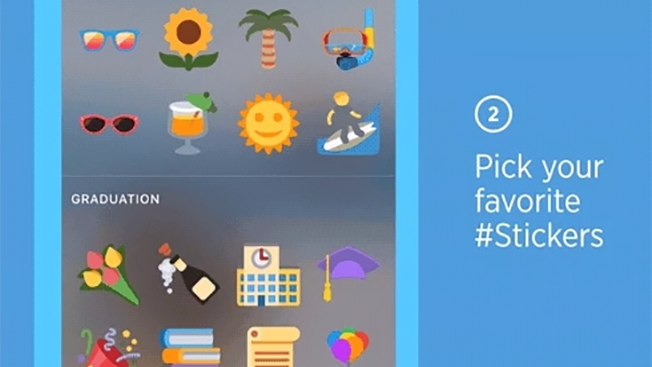 "Soon, you can browse our rotating sets of stickers to join in on real-time conversations, and select from the library of hundreds of accessories, emoji, and props to make your photos more fun," Twitter wrote in a blog post this morning. "Use them to share what you're doing or how you're feeling, to show support for a cause, or to just add some flair." The addition comes on the heels of allowing marketers to target users based on emojis they include in tweets. Users (so far mostly Twitter employees) have already begun using them to put top hats on toddlers and cats on—well—dogs. No sign yet of whether mainstream users will give the feature a gold star.